Been flying around above the polar circle and tried a little timelapse. It’s very short, but sweet in my opinion. OK, not quite on the same level, but good company none the less. Have a look at the Volvo test track near Gothenburg from above. Anyone here have any experience with ceramic coating to protect your paint job and make keeping the outside of your car in decent shape a bit easier? Today I picked up my new car from the dealer, an Engine Red Hyundai i30 N. For those of you not familiar with the car, it’s basically Hyundai’s first attempt at a properly hot hatch for more performance focused buyers. So it tends to go up against things like the Golf GTI and Peugeot 308 GTI. 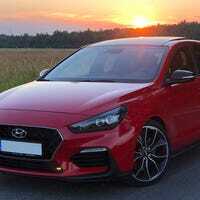 On my test drive tomorrow of a Hyundai i30 N? I basically found out this car existed a few weeks ago and after reading reviews, watching as many videos as I can about it, I am starting to seriously consider getting one of these. I’m not a frequent poster, but some of you may remember a few posts about a Mazda 6 MPS or Mazdaspeed 6 for U.S. folks that I bought last summer. Long story to follow, scroll down for summary, haha.